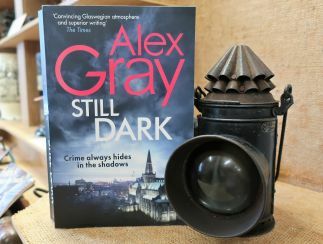 No.4 in the series – ‘Still Dark’ by Alex Gray meets a coastguard lantern. The Museum has a wide range of artefacts that helped bring light to the darkness. There are strike-a-lights used by Early People, a crusie lamp from Rothesay Castle, Victorian candle moulds and this lantern with its lovely fluted top. Alex Gray is a regular Bute Noirer and we are delighted to welcome her back. ‘Still Dark’ is the 14th in her immensely popular William Lorimer series. Alex will be in Rothesay Library on Saturday 4th and in Bute Museum on Sunday 5th.